John has a passion for family safety, having served as a law enforcement chaplain and seeing the aftermath of victimization, and founded the Fighting Back Institute in 2009 after serving 3 years as a regional director for the National Security Alliance. 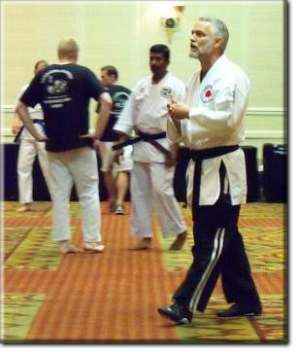 An accomplished martial arts/self-defense instructor, John was inducted into the United States Martial Arts Hall of Fame for his “kid-safe” and “women-safe” advocacy work across the nation in August, 2008 and the Master's Hall of Fame in 2016. John has conducted hundreds of workshops in school, camp, church, civic and community settings, focusing on danger awareness education, victimization avoidance, and practical self-defense techniques. He has also taken this message to Central America, the Caribbean and Africa. John is also an Executive Director with The John Maxwell Team, and serves as a JMT President's Advisory Council member. John's message of leadership, personal growth and influence continues to inspire and challenge young and old...and serves as a platform to address the growing problem of bullying in schools. Teaching young people how to lead themselves, add value to others, and serve as agents for positive change fosters a spirit of transformational change that has positive benefits for the student, the school, and the community as a whole.